All entities in this world, knowledge, faith, work, residence, happiness, food etc., being constituted of the three gunas, are of different kinds and different gradations, such as, low, mediocre or high. But entities and activities pertaining to Thee, Thy temples and Thy worship are beyond these three gunas. By resorting to these, I will soon become perfect (free). O Lord! With my mind fixed in Thee, I will live happily dedicating all my actions to Thee. I will go to the holy places, where Thy devotees go, or where they went in the past. I will maintain an equal minded behaviour towards a robber or a Braahmin and also towards animals. Shedding the defective mental attitude of dishonour, honour, enimity, jealousy etc., I will worship Thee in all beings. In all the entities, until oneness with Thee does not clearly manifest, I will continue to worship in this way only. By which when the knowledge of oneness suddenly dawns, I will move about with total identification with Thee. O Lord! Once the practice of Bhaagvata Dharma is begun, it can not be totally lost. Therefore. O Lord! set me on the captivating path of devotion. O Lord! In order to get firmly established in Bhakti Yoga, I need good health and long life. Fortunately, to achieve this also, service at Thy feet is to be done. Wonderful it is that the medicine is milk only. Long ago, Maarkandeya was told by an astrologer that his life span was of twelve years only. He worshipped intensely at Thy feet for one year and when death approached, it was driven away by Thy emissaries. Always inclined towards worshipping Thee, Maarkandeya was thus endowed with a blessing of living for ever. He continued to do penance on the banks of Pushpabhadraa river and revelled in incomparable bliss for six manvantras. In the seventh Manvantra, the Indra there, tried to seduce him with the help of celestial damsels, soft breeze and Cupid the god of love.They did not succeed, rather they were scorched by the heat generated by the sage's yoga. Who can overcome Thy devotee? Thou as sage Naaraayana, along with Thy friend Nara went near Maarkandeya, and were repeatedly praised by him with great joy. Thou offered to him various boons, but he did not care for them, being satisfied to his innermost self with devotion to Thee. Then he asked to see Thy Maayaa. Being ignorant of the sorrows caused by Maayaa, he chose this boon out of sheer curiosity. As soon as Thou left, the clouds were tossed about by unruly winds and torrential rain waters made the waters of the seven seas overflow, submerging the whole world. Maarkandeya wandered in these waters for millions of years. Exhausted, he saw far away, a wonderous Infant, Thee alone, with the body with a blue hue, lying on a banyan leaf, with the toe placed in the lotus mouth. Maarkandeya's body was full of horripilation and he rushed to touch Thee. He was drawn into Thee by Thy breath. There he saw the expanse of the whole world. Then thrown out by the breath, he was looked at by Thy sidelong glances. In great joy he approached Thee wanting to embrace Thee. Just then, Thy form disappeared and he found himself in his aashram as before. Lord Shiva, along with Gauri went to Maarkandeya, desirous of seeing Thy devotee. He gave the boons of freedom from old age and death etc., without being asked for, which the sage had also acquired by his penance. In this manner, Lord Shiva was also pleased by the worship of Thee alone. This also clearly shows that Thou are Trinity itself Brahmaa Vishnu and Shiva , and also the inner controller of all. In the Satyaloka, in three parts, placed one above the other are located the abodes of Brahmaa Vishnu and Shiva. Above all these is the realm of Vaikuntha which is free from the effects of Maayaa and Prakriti, there, in the Causal Waters as also in the house of cowherds, Thou do shine in a pure Sattvic form as Sat Chit Brahma the non dual self. 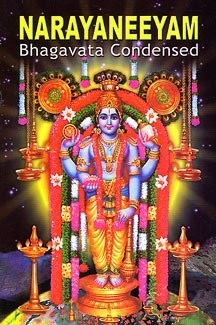 O Lord of Guruvaayur! do save me from all diseases.